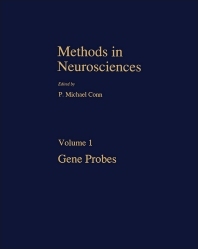 Methods in Neurosciences, Volume 1: Gene Probes is a compendium of papers that deals with the developments in molecular biology, cell biology, and electrophysiology. Section I deals with gene expression using the Xenopus Oocyte system for expression and cloning of neuroreceptors and channels. One paper presents a method in studying the molecules in the brain related to neurotransmitter receptors and to the voltage channels in the brain by ""transplanting"" functional neurotransmitter receptors into the membrane of frog oocytes. Section II describes in situ and solution hybridization and the continuation of in situ hybridization with immunohistochemistry. One paper discusses the benefits of using alkaline phosphatase-Dig-dUTP-labeled oligonucleotide probes in high-resolution in situ in terms of ease of performance, safety, and fast detection rendering. Section III addresses the screening, sequencing, and cloning, the process of which includes the rapid identification of DNA clones. One paper outlines the methods and materials that are used in such identification. Section IV explains lineage analysis and Section V discusses molecular pathology, including the molecular pathology of Alzheimer's disease. This collection can prove useful for geneticists, molecular scientists, and academicians involved in neuroscience and pharmacological sciences, as well as researchers in geriatrics. What Is a Positive Result?